Can IT Outsourcing Make Your Practice More Profitable? In solo practices or small law firms, competition for new clients is fierce. Leveraging technology to help streamline the efficiencies of these practices, or using it to offer new service lines to clients, are just two ways that IT outsourcing can improve the bottom line of today’s law firm. As lawyers are tasked with doing more with less, IT outsourcing is a way to improve a practice and make it more profitable. How can IT outsourcing prepare a practice for the future? Get a free assessment of your technology infrastructure to determine how the cloud could help. According to The Balance, roughly 75% of the more than 1.3 million licensed lawyers in the U.S. work in a solo or small private practice. Only 14% of attorneys work in firms with 100 lawyers or more. These small firms have the same struggles as any small business, from the struggles to multi-task, to establishing a bottom line that’s in the black. The increasing costs of malpractice and healthcare insurance are extremely concerning for most small firms. Ironically, the lawyers in small firms suffer from the same time crunch as an attorney striving for partnership in a big firm, chiefly, long hours and an even longer task list. This is precisely why the majority of lawyers have now adopted some sort of IT outsourcing as part of their solo or small practice. There is a precedent for this; law firms have been outsourcing at least some of their most basic technology services, such as email and research, for the past decade. Small firms can rarely hire full- or even part-time IT staff and their bottom line are typically too tight to be able to establish a hardware or on-premise data storage solution. This leads us to the first benefit of IT outsourcing for small law firms: Cutting costs. Small firms can contract with a managed service provider to first, assess and then inventory critical business functions. Taking a candid look at how you’re storing data, how research is conducted, how files are shared, and so on, will help determine how to achieve workflow efficiencies. IT outsourcing can balance the standard costs of doing business. For example, most software, infrastructures, and platforms, can harness cloud technology. This eliminates the equipment costs typically associated with setting up and maintaining a law firm. Today, everything from time and billing to e-discovery can be accomplished in the cloud. These services are subscription-based, meaning you pay one monthly fee – a budgeted expense that lacks the surprises that come with equipment failure and replacement. Services such as electronic-discovery of digitally stored information are a logical choice for IT outsourcing. Electronically stored information (ESI) has increased the complexity and cost of the discovery process ten-fold. New outsourced services such as litigation support and virtual assistants have forever changed staffing models in law firms. These resources simply help lawyers do more in an economy of scale suitable for the solo practitioner or small law firm. More likely than not, your law firm already outsources some IT function. 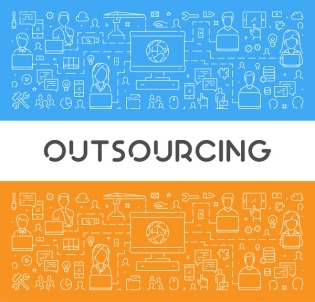 The question is, should you look at outsourcing additional IT functions or, in varying cases, should you outsource your entire IT department? No one has an across the board answer to that question. Every law firm’s requirements are different. Assessing your firm’s individual needs related to data storage and management, security, email and communications, and file sharing is the first step toward improving efficiencies. It should all be part of a managed IT service provider relationship designed to improve your firm’s bottom line. Conclusion: Can IT Outsourcing Help Your Practice? Small law firms are using IT outsourcing to achieve a competitive advantage. Whether your firm uses a software vendor to provide document collaboration and storage, email, or even office tools, is an important discussion that you should be having with a trustworthy technology resource. Taking the next step in the cloud, or streamlining existing cloud services could be exactly what your firm needs to stay productive and profitable in 2018. Find out how partnering with TOSS C3 can benefit your firm. Request a quote on IT outsourcing today.